Pizzazz, celebrity-fiefdom, sparkling chandeliers...the list goes on. The second word should give you the biggest clue. 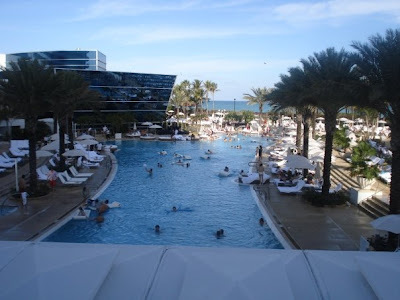 It's in Miami and sits on the ocean strip formerly known as Millionaires Row. 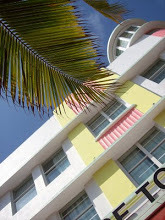 This hotel was the starlet of the 1950's and 60's. Can you guess? 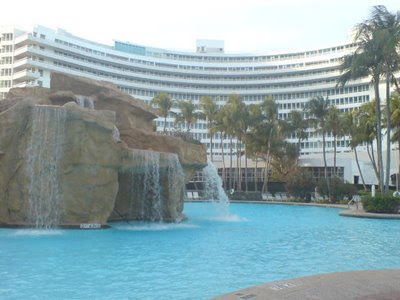 Recently I visited the Fountainebleau Hotel to absorb and assess the orbital renovations that totaled $1 Billion. Yes billion with a "b". 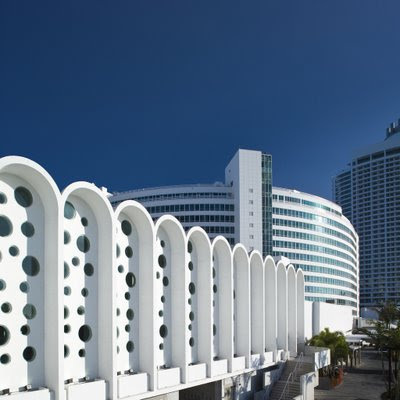 Is the Fontainebleau a spectacular blend of Miami’s glamorous golden era and stylish modern luxury? You be the judge. * Opened in 1954 and named after the Fountainebleau chateau in France. * He was criticized for designing "outside of the box" literally! This was the first building shaped in a curve instead of the "Square-shaped" traditional buildings. 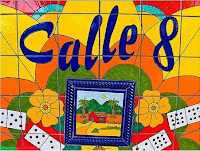 * The signature "MIMO" features included the famous "cheese wall". I always called it the bubbles. (see picture below). * This was THE place to be in the 1950's--celebrities, the rich, the famous, the nobody who wanted to feel rich and famous. * Celebrities like the Rat Pack, Jackie Gleason, Frank Sinatra, Lucille Ball glamorized the hotel with their presence and performances. * Black celebrities could perform there but never stay as a guest in the hotel: Sammy Davis Jr. The real shows happened across town in "Black town", now called Overtown. The black community were treated to a real toe-tapping, inhibition absent, no hold bars celebration. 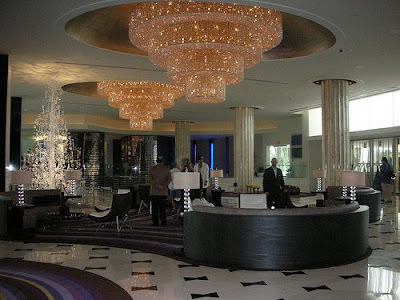 The lobby receives high marks for preserving the elements and therefore, the spirit of the 1950's---the bowtie marble floor, the sparking chandeliers, the non-functional but decorative columns. And yes, the famous "Staircase to Nowhere" is still there. 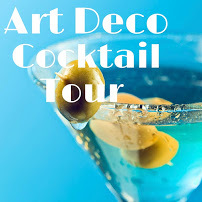 (For a guided tour of the hotel with a storytale history of the past leading to the present, reserve a spot on my tour). After walking the grounds, my heart was heavy when I couldn't recognize the pool area. Every icon that was the soul of the resort has vanished. Gone is the Octopus inviting the children to swim in the children's pool. Lost is the island with faux rock formation and real waterfall (pictured above). Gone is the double skyscraper diving platform. Today, various sleek rectangular pools are wedged in like a jigsaw puzzle inbetween alabaster walkways and pool lounge chairs. There's one for each guest and entourage to commandeer for their pleasure. So we returned to the lobby and headed to one of the three new restaurants advertised on billboards across town. For my brief review of Scarpetta, click here. The energy. Since the re-grand opening that featured the Victoria's Secret Angels, and numerous celebrities, the hotel is brimming with hotel guests, locals, and curious passer-bys. People come from all walks of life, backgrounds, states, countries. 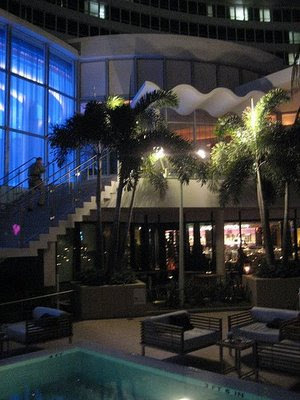 The hotel still has panache and everyone wants to be a part of it this electrifying glamour scene.